Create a punk shirt with a can of spray paint! It's easy to make your own punk shirt. All you need is a little imagination and a few supplies and you are ready to create a fashion as unique as you are. The basis of punk style is cutting-edge looks and individuality. Expressing yourself through your clothing cannot only make a fashion statement, but can also show off your creativity. Why buy a punk shirt when you can create your own at home in just a few simple steps? Tie-dye is not only for hippies, but can be for punks, too. Try this approach to tie-dye your shirt punk rock style. Take a plain white t-shirt and lay it on a flat surface. Be sure the shirt was washed first! Pinch the shirt in the middle and twist it into a spiral shape. Spray the shirt with dark spray paint such as black or gray and let it dry completely, making sure it is still twisted. To create a layered look, twist another spiral in a different part of the shirt, and spray it with another color. Flip the shirt over and repeat the process on the back and on the sides as well. Repeat this process until you are pleased with the result. Allow to dry completely between sprays and before finally wearing. 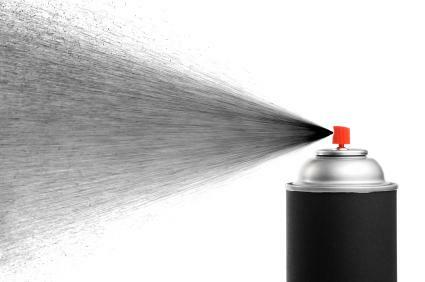 Some things to keep in mind when using spray paint are to be sure you are using the paint in a well-ventilated area so you are not breathing in the fumes. Also make sure you lay the shirt on a surface that paint won't damage. There is spray paint specifically designed to be used on fabric. This type of spray paint will dry soft on your shirt instead of stiff like regular spray paint. Since punk style is all about self-expression, a great way to express yourself is through words. Why not take a plain t-shirt and write slogans and words on it with permanent paint or markers? You can even take your favorite song lyrics and write those on the shirt. To add even more character to your shirt, splatter paint on the shirt. You can create a graffiti effect by writing on the shirt in different colors and in different textures. Another version of a punk shirt is to take a ripped up t-shirt and either using duct tape or safety pins, put the rips back together. You can cut or shred a shirt as well and place pins over the tears for another variation. Use different size pins and place them randomly on the shirt and even on the sleeves. With the pins you can even create patterns and designs. You can also turn a t-shirt into a tank top to make it look punk rock. Simply cut or tear off the sleeves and leave them looking ragged. This also works with a button-down shirt that has sleeves. You can make your own punk shirt with whatever materials you have on hand. The most important thing to keep in mind is to make it a design all your own that reflects your personal style and individuality.